India will take on Sri Lanka in the penultimate Test of the three-match series here on a green track at the Vidarbha Cricket Association (VCA) Stadium in Jamtha. The Virat Kohli-led side had drawn the first Test after putting a formidable show at the Eden Gardens. With Hardik Pandya, India's first-choice for seam bowling, absent from the squad, Virat Kohli could go for young Tamil Nadu back-up all-rounder, Vijay Shankar. Shankar has earned a Test call-up as replacement for Bhuvneshwar Kumar, who has taken off for his wedding. On the other hand, with Sri Lanka managing to escape with a draw in the Kolkata Test, there are chances that pacer Lahiru Gamage will lose his place in the playing XI after he proved expensive at the Eden Gardens track where he conceded 156 runs in two innings with only a wicket. 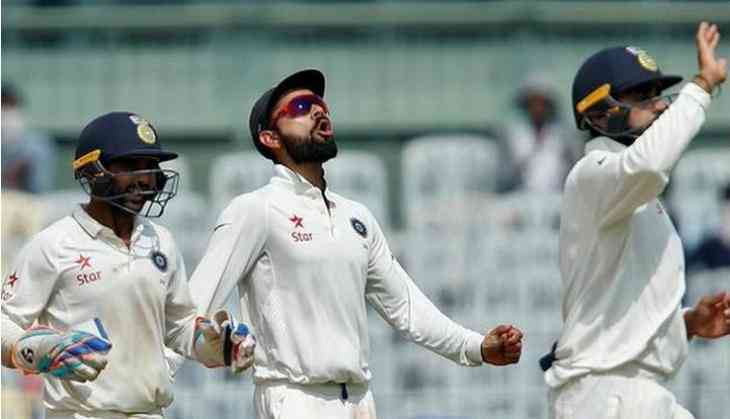 India: Virat Kohli (Captain), Lokesh Rahul, Murali Vijay, Cheteshwar Pujara, Ajinkya Rahane, Wriddhiman Saha (WK), Ravichandran Ashwin, Ravindra Jadeja, Mohammed Shami, Umesh, Yadav, Ishant Sharma, Vijay Shankar, Kuldeep Yadav and Rohit Sharma. Sri Lanka: Dinesh Chandimal (Captain), Angelo Mathews, Dimuth Karunaratne, Niroshan Dickwella (WK), Dhananjaya de Silva, Suranga Lakmal, Dasun Shanaka, Viswa Fernando, Lahiru Gamage, Lakshan Sandakan, Sadeera Samarawickrama, Dilruwan Perera and Roshen Silva.